Whether you are looking for an awesome game for Easter, or just a great game that the entire family can enjoy, you have to check out Hoppy Floppy’s Happy Hunt™ Game from Educational Insights. Hoppy Floppy’s Happy Hunt™ Game is easy to set up and take down. 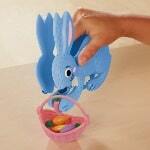 It comes with very durable, heavy duty, plastic pieces for the rabbit, carrots, and baskets. These pieces are very easy to give a wipe clean when needed. The spinner is the typical grade spinner that you find with games that have heavy cardboard spinners so the spinner is a good quality for a cardboard spinners. The spinner does warp a bit with use because of being made out of cardboard. 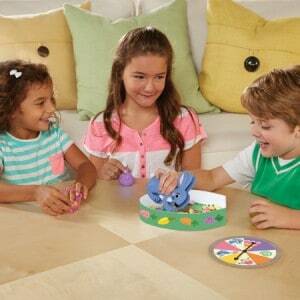 I would love to see the spinner made out of plastic with rubber bottom to keep it in place on the table when spinning. Having said that, the spinner being made of heavy cardboard would not deter me from purchasing or recommending the game. *Great for little ones that are learning colors. We played Hoppy Floppy’s Happy Hunt™ Game a number of times now and have had everyone from my 7 year old all the way up to a grandparent play. During all our games, everyone was laughing and the adults commented on how cute the came was. 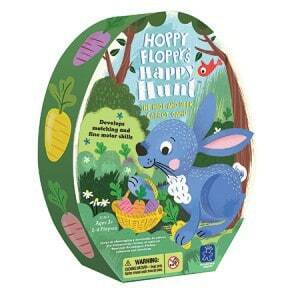 Hoppy Floppy’s Happy Hunt™ Game can be played with anywhere from 2 to 4 players. We played games with 2 players and with 4 players and it is fun either way. What makes the Hoppy Floppy’s Happy Hunt™ Game exciting is the chance aspect of the game including the chance to “steal” a carrot from another player or having your basket “tip over” and having to dump your carrots into the forest and start collecting again. The game really had us smiling and laughing. The Hoppy Floppy’s Happy Hunt™ Game retails for $14.99 USD on Educational Insights at the time of this post. As with other Educational Insight products, Hoppy Floppy’s Happy Hunt™ Game comes with the “Playful Promise,” which means that you have 365 days to “Love it or return it.” You can also find Hoppy Floppy’s Happy Hunt™ Game on Amazon.com. I am excited to announce a giveaway for two awesome Educational Insight products; the GeoSafari Jr Bright Eyes Magnifier and Hoppy Floppy’s Happy Hunt Game. One lucky MomMomOnTheGo fan will receive both of these awesome Educational Insights products. This giveaway is open to residents of Canada and the US who are over the age of 18 and where permitted by local laws to enter and win giveaways. Please ensure that you read the full terms and conditions found at the bottom of the entry form. I like Freeze Up!®, looks like fun. Grab some tongs and get grillin’!, so cute for summer! I think my girl would love the GeoSafari® Jr. Underwater Explorer Boat!